ANP was going to wait until tomorrow to follow up on Sunday’s explosive news about the DNC staffer that was murdered last July amidst the Wikileaks revelations about the DNC and the Clinton campaign rigging the primaries, but the amount of breaking news since yesterday, has pushed this to the forefront. For those that did not read yesterday’s piece titled “MSM Attempts To Kill ‘Murdered DNC Staffer Story,’ And Instead Blows Up The Internet,” a very brief summary because quite a of new information has become available since then. Washington Post attempted to label the recent revelations by a former DC homicide detective investigating Rich’s murder, saying he discovered Seth Rich was communicating with Wikileaks, as a “conspiracy theory,” when Internet entrepreneur KIMDOTCOM revealed that Rich was the source of the leaks to Wikileaks, Kim himself was involved and offered congressional testimony, with Sean Hannity then publicly inviting him to his show to discuss it. There is much more showing Kim had prior knowledge going back to 2014, but since then, a number of revelations have come out, so… moving along. 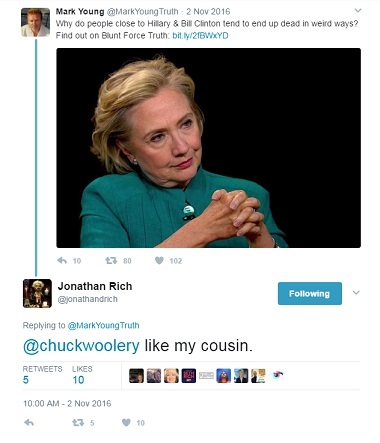 Jonathan’s tweet was deleted shortly after, but the internet is forever, and it was archived, screen shot below, and link to archive here. In August 2016, Wikileaks highlighted the fact that a man named Brad Bauman was the Rich family’s new “spokesman,” and described him as “a professional Democrat crisis PR consultant.” According to his LinkedIn page, Bauman’s experience is listed a a partner for The Pastorum Group and “Managing a crisis communications and full service public relations firm,” as well as being a communications consultant “Providing strategic communications advice to Democratic candidates and labor unions.” Both those positions are listed as current. Evidently his services include going after any high profile personalities that are discussing the Seth Rich murder on Twitter, which includes Former House speaker and presidential candidate, Newt Gingrich, Fox News host Sean Hannity, the original Fox 5 writer that reported on the connection between Seth Rich and Wikileaks, Malia Zimmerman, and KimDotCom, who claims he knew Rich, was involved, and offered to provide testimony to Congress. The reason Bauman went after Newt Gingrich is because Gingrich expressed his hope, on national television, that the Special Counsel tapped to look into Russia influence, would also look into the Clinton connections with Russia and then Gingrich brought up Seth Rich, calling it a “very strange story,” that he was “assassinated” after giving Wikileaks tens of thousands of emails and attachments. 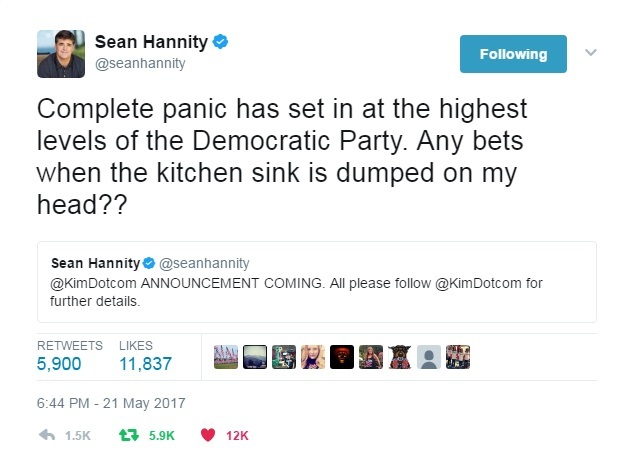 Bauman’s attacks against Hannity is because he invited KimDotCom onto his radio and television show to discuss what he knows, then told his readers there was an announcement coming and to follow KimDotCom for further details. 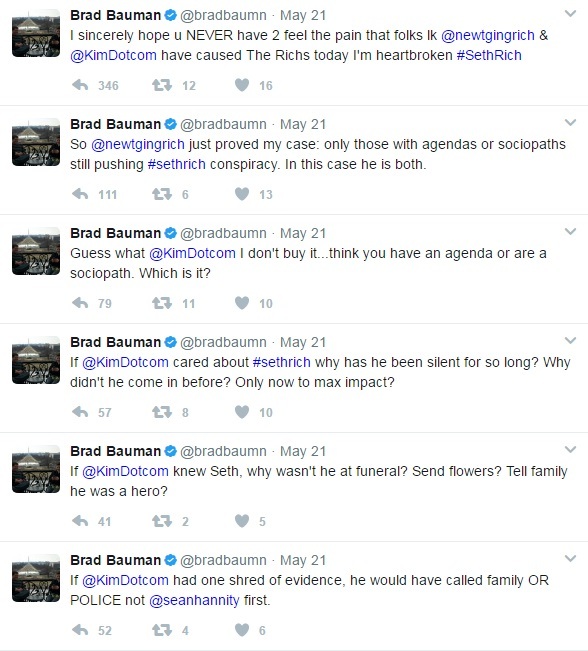 As to Bauman’s question of why KimDotCom didn’t attend Seth Rich’s funeral…. maybe Bauman should know that the man resides in New Zealand, and perhaps, just maybe, he wasn’t willing to risk being beaten and shot in the back twice in an “attempted robbery” by making the trip? Sounds like Bauman is already setting an argument against any “proof” that may come out by way of actual emails, showing that Rich was indeed communicating with Wikileaks, as has been “implied” by Julian Assange himself when he spoke of how many “risks” leakers take, then immediately using Seth Rich as an example, while saying they never reveal their sources. Notice Wikileaks deliberately used the hashtag #SethRich. 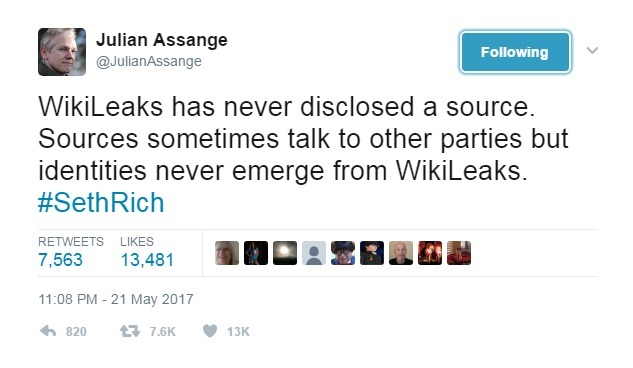 Between Assange’s previous interview, Wikileaks offering a 20K reward for information leading to the arrest of Rich’s murderer, and this latest tweet, he is practically drawing a map to lead people to his source while “technically” not naming him. Hannity appears to be right. 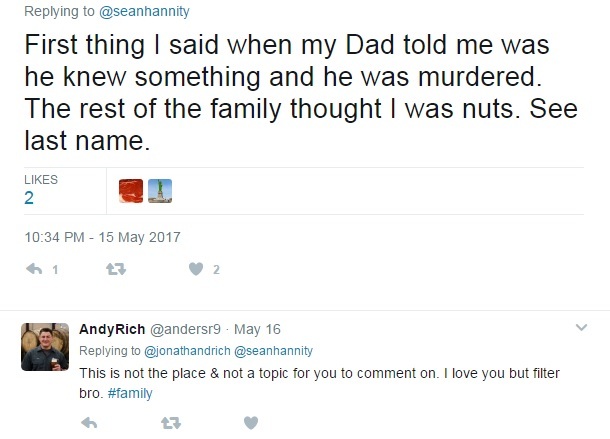 There is a coordinated campaign against anyone that dares question the “official” narrative that Rich’s murder was a robbery, despite nothing being taken from him, as well as the meltdown on Twitter by a “democratic crisis consultant,” which in and of itself is odd that someone like that would be speaking for the family. 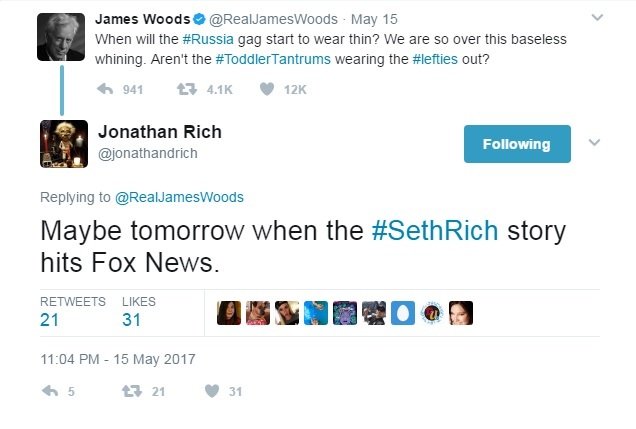 It seems that it isn’t just Independent Media asking questions, but as shown above, Seth Rich’s own cousin seems to think “he knew something” that got him killed. One would think that the murder of a young man, who just happened to work for the DNC, had access to the very data that Wikileaks was publishing, and was murdered as Wikileaks was releasing those emails, would have the media all over it, rather than attacking anyone that dares question the official narrative. KimDotCom is expected to offer some type of information on Tuesday and we will be sure to bring it to readers if it is as explosive as many seem to think it will be.